Can you contain the ZOMBIEPOX infestation before the town is lost? It started with a fever and a call from a small town physician. You were sent to investigate and do some paperwork – nothing major. What you found was far more dangerous than expected. Two of the townspeople were running loose and reports that they were dead before they walked out is rather alarming. You make a quick call and the town is quarantined. The world outside might be safe, but the town and its people desperately need your help. 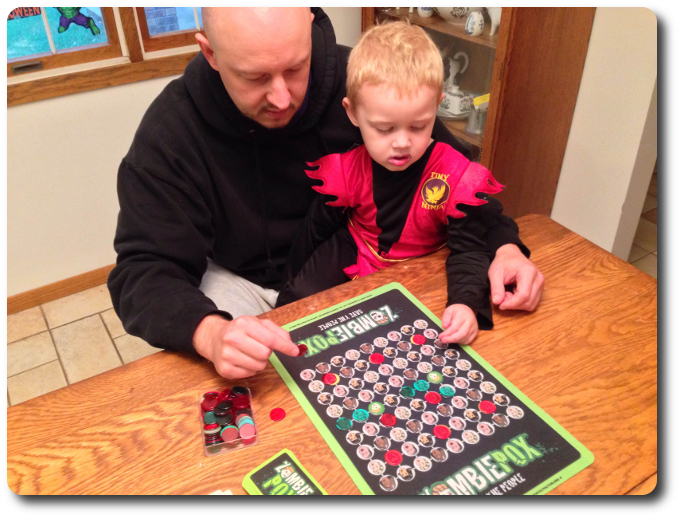 ZOMBIEPOX, designed by Zara Downs, Mary Flanagan, Max Seidman and published by Tiltfactor, is comprised of 1 rubber game mat, 28 ZOMBIEPOX cards, 50 Immunization chips (red), 40 Infection chips (green), and 6 Zombie chips. The Infection and Immunization chips are clear plastic and the Zombie chips are thick cardboard. 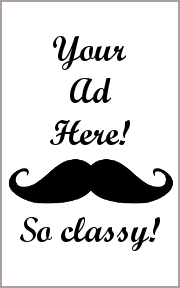 The cards are printed on standard cardstock and durable. The game mat is made of rubber and lays flat without curling at the edges. Included with the game are two plastic cases. One holds all the chips and the other holds the cards. Completely unnecessary, but a nice touch from Tiltfactor that helps the game owner keep their game bits organized when placed back in the box. The artwork is minimal, but younger Child Geeks and Parent Geeks who do not care for images of the macabre nature will be a bit shy around the game. While the most horrific of the images is shown on the game’s box (undead crawling baby, anyone? ), the rest of the game is surprisingly “zombie lite”. The only time a player will see an illustration of a zombie is printed on the game mat and the Zombie chips that are placed when the zombie infestation gets out of hand. As always, Parent Geeks should look at zombie and horror themed games before putting them in front of their children or anyone suffering from kinemortophobia. To set up the game, first unroll the game mat and place it in the middle of the playing area. Second, shuffle the ZOMBIEPOX cards and place them, face-down, next to the game mat. This is the draw deck. Leave room for a discard pile. Third, separate the chips into three different pools. When completed, you should have an Infection chip pool, an Immunization chip pool, and a Zombie chip pool. Fourth, take 2 Zombie chips and place them on the matching images found on the game mat. These represent the first two ZOMBIEPOX victims that are responsible for this whole mess. The zombie tolerance level sets the maximum number of Zombie chips that can be present on the game mat before the game is lost. And, yes, the two initial zombies on the game mat count. For reasons that should be obvious, only attempt the “Hero” zombie tolerance level if you are either very, very good at the game or in desperate need of feeling like a loser. That’s it for game set up. Time to save the town! ZOMBIEPOX is played in turns with no set number of turns per game. On a player’s turn, they will complete the following sequential steps. Note that the direction an arrow is pointing should be determined by orientating the card position so that the player is looking at the townspeople’s faces right-side up on both the game mat and the ZOMBIEPOX card. There are two different types of ZOMBIEPOX cards. These are “Spread” ZOMBIEPOX cards and “Outbreak” ZOMBIEPOX cards. If no more ZOMBIEPOX cards are available in the draw deck, shuffle the discard pile and place it face-down to create a new draw deck. The “Spread” ZOMBIEPOX card shows how the infection in the town is passed. An arrow indicates the direction the infection spreads starting from EVERY person who is currently infected or is already a zombie. The ZOMBIEPOX never spreads diagonally and ONLY in the direction indicated by the arrow shown on the card. The “Outbreak” ZOMBIEPOX card does not show an arrow to indicate the direction the ZOMBIEPOX spreads. Instead, an image of 1 of the 5 townspeople is shown. A green Infection chip is placed on every image that matches the person indicated on the card, but only if the image location is next to an uninfected and unvaccinated person. Note that any person with a red Vaccination chip on them is immune to the spread of the ZOMBIEPOX and random outbreaks. This means they will also never become a zombie. After the outbreak and spreading of the zombie infection has been completed, all the players should review the game mat to determine if any new Zombie chips should be placed. A person can become a zombie in several ways. If the infected person is surrounded on 4 sides by other infected people (or zombies), they become a zombie. If the infected person located on the edge of the game mat is surrounded on 3 sides by other infected people (or zombies), they become a zombie. If the person is an infant (indicated by an image and a yellow background) and they immediately become a zombie when infected. The Infection chip is removed and replaced with a Zombie chip. The removed Infection chip is placed back in the Infection chip pool. The bottom of every ZOMBIEPOX card will list how many people can be “vaccinated” or “cured” on the player’s turn. To vaccinate a person, that person must be healthy and not currently be infected (as indicated by the presence of a green Infection chip). A red Immunization chip is placed on the person when they are vaccinated. To cure a person, that person must currently have a green Infection chip on them. Curing the person removes the green Infection chip and replaces it with a red Immunization chip. The Infection chip is returned to the Infection chip pool. Any person who is a zombie cannot be cured…ever. They’re dead, Jim. Finally, the player should do a quick count of all the Zombie chips currently on the game mat and determine if there are any Infection chips left in the pool. If the total number of Zombie chips is equal to or less than the zombie tolerance level defined during game set up AND there are still Infection chips left in the pool, the next player in turn order sequence now goes starting with step 1 noted above. Otherwise, game over, man. ZOMBIEPOX will end one of three ways. If the total number of Zombie chips on the game mat is ever greater than the established zombie tolerance level, the town and the game is lost. If all the Infection chips are on the game mat, the town is considered “dead” and the players have failed to contain the outbreak. The players have lost the game. If the players determine there is no possible way for the zombie infestation to spread, the number of total Zombie chips on the game mat is equal to or less than the zombie tolerance level, and there are still Infection chips left in the pool , the players have won and saved what little is left of the town’s populace! 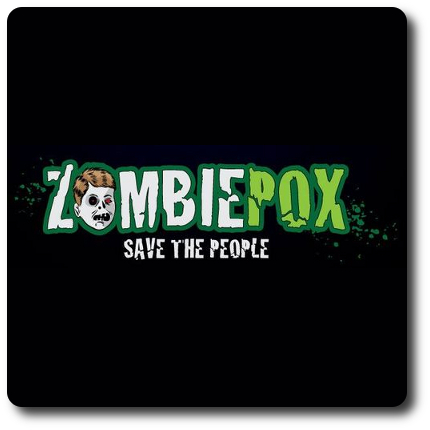 To learn more about ZOMBIEPOX, visit the game’s web page. This is, by far, one of the most non-violent, non-horrific, and non-bloody zombie themed games I have ever played. In fact, ZOMBIEPOX portrays a zombie outbreak as nothing more than a really bad case of pinkeye…that kills you…and then you come back to eat brains (supposedly). Extra points for you if you know where the pinkeye reference I just used originated. Zombies portrayed in this fashion should put some of our more sensitive Parent and Child Geeks at ease. I do not count rejections from Parent and Child Geeks who do not play the game, but they certainly do limit the number of players who will try the game. For me and mine, I don’t see anything in this game (theme or illustrations) that my little geeks are not already familiar with. Heck, there are more graphic illustrations of a horrific nature found in Goosebumps books than what is included in ZOMBIEPOX. The game does not strike me as overly complicated in its execution, but keeping ahead of the zombie infection is going to be a real challenge. Especially if the players attempt to set their game’s victory condition close to impossible. I don’t believe the game play itself will be out of reach of Child Geeks as young as 6-years-old, however, and the complexity and depth of the game’s problem solving should appeal to the Parent Geeks and our Gamer Geeks. I don’t see any reason why the game will not be fully approved and endorsed. All speculation, mind you, and we won’t know until we get the game in front of players. But from what I am seeing in the box and after reading the rules, this game would appear to be a winner. Teaching ZOMBIEPOX is a fairly straightforward exercise. Just make sure you describe how an infection takes place and how it spreads. After that, jump in and fight the sickness. 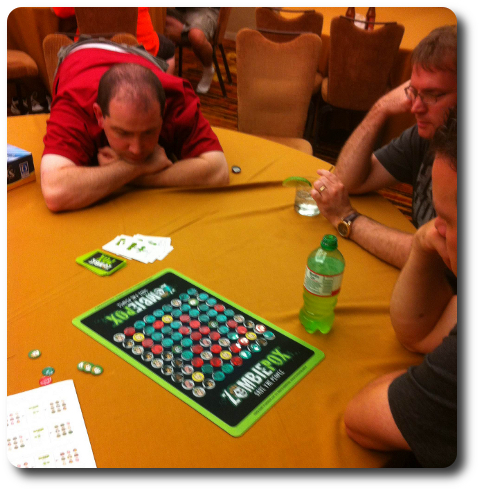 ZOMBIEPOX is a cooperative game, which means each move by every player can be discussed openly. Players will all win or all lose. This is a team exercise in problem solving and risk management. Of course, like all cooperative games, the playing session runs the risk of one player being controlling and directing everyone, but that is something for all the players to recognize and (hopefully) not allow. Younger and inexperienced players will ask for help and suggestions, which is perfectly fine. In fact, encourage it. Cooperative games are a great opportunity to teach new strategies, discuss tactics, and learn more about your team members who are more times than not your opponents. I should also note that ZOMBIEPOX can be played as a solitaire game. The game set up and the rules are the same. This will allow Parent Geeks to play the game with a younger Child Geek who could not play the game by themselves as an active member of the team. I do this all the time and highly encourage other Parent Geeks to play solitaire games with their children as often as possible. While the Parent Geek will be doing all the work, having a Child Geek participate in the decision making is a lot of fun. Plus, it allows Parent Geeks to introduce more complex games to their Child Geeks well before they are even capable of fully grasping them. Start them young, I say! We must do all we can to ensure the next Geek Generation is crazy awesome. After teaching ZOMBIEPOX to my two oldest Child Geeks, I asked them what they thought of the game so far. My oldest brings up a great point. Most (not all) Zombie games involve shotguns, chainsaws, blood, gore, and imagery that suggests gruesome violence. Which, honestly, is why zombie themed games are so popular. ZOMBIEPOX does have zombies, but this is a puzzle game that focuses on control and containment versus ammo and explosives. A nice change, if you ask me. Let’s play ZOMBIEPOX and see if we get some feverish excitement or the game just makes us sick. The Child Geeks both enjoyed and hated the game. They loved working together as a team and rejoiced every time a forced infection or an outbreak was halted due to the people they helped cure. What they didn’t like was when the game took a serious turn and the infection became less and less manageable. When the Parent Geeks took the reins and helped make the decision, the games usually ended in a victory. When the Child Geeks decided to lead, the town usually fell. Usually, but not always. The Child Geeks demonstrated they understood how to cure the infection, but not necessary how to contain or control it. Their decisions tended to be focused on the immediate infection rather than considering the town as a whole. Still, the ability to see the “big picture” and work towards a single goal is referred to as “strategy”, which is a geek skill that some Parent Geeks are still learning. After watching several games and participating in many more, I observed that the Child Geeks were learning from every mistake and making better choices. Simply excellent. Speaking of excellent, all the Child Geeks voted to approve ZOMBIEPOX and only said negative things about it when the game was lost. Which, of course, was the game’s fault, never theirs. The Parent Geeks who wanted to play ZOMBIEPOX thought the zombie illustrations were well within the bounds of being acceptable for their Child Geeks and very much enjoyed the game play with both their family and their peers. The Parent Geeks set their aspirations too high when they first played, however, by choosing to attempt to win the game using a zombie tolerance level of 2. The game did not end well. Luckily, setting up and resetting ZOMBIEPOX is a very simple and quick exercise and the Parent Geeks were back at it a bit wiser and none the worse after their disastrous attempt. Most of the Parent Geeks thought the game was best played with a zombie tolerance level of 5 which allowed them to control and contain with difficulty, but never to a point where things were going really badly. The only time when things started to get hairy is when the random outbreaks occurred. Then the Parent Geeks scrambled, which was a lot of fun. Eventually, a number of the Parent Geeks felt comfortable with the game and attempted to play it with a zombie tolerance level of 4. One group even tried the zombie level tolerance of 2 again. Regardless of how the game ended, all the Parent Geeks voted to approve the game. The Gamer Geeks were not very impressed with the game when I put it in front of them. One Gamer Geek said, “Wait…is this a puzzle game? I thought you said this was a zombie game.” Ha! Excellent. The Gamer Geek is correct. This is an abstract puzzle game that just happens to have zombies in it. The zombie theme is pretty much pasted on, however, and could easily be replaced by any non-curable but preventable disease. Once the Gamer Geeks started playing it, however, their mood shifted from skepticism to optimism. And then frustration. True to form, most of the Gamer Geeks swaggered to the game table and set the zombie tolerance level to 2 with much bravado. They failed. After they came to terms with how bad the game just slapped them, they reset the game mat, set the zombie tolerance level to 4, and took the game much more seriously. Victory was never a sure thing and several games were lost. When the game was put away, I asked some of the Gamer Geeks their thoughts. One Gamer Geek said, “This is an interesting puzzle game and I would play it as a casual filler.” Another Gamer Geek said, “I don’t like abstract games, so I’m not really the right person to ask, but I don’t think this is a bad game. Just not a game I enjoy.” In the end, all the Gamer Geeks voted to approve the game. Their only negative comment was the randomness generated by the occasional “Outbreak” ZOMBIEPOX card (there are 8 “Outbreak” ZOMBIEPOX cards in the deck, which is roughly 28% of the total deck), but they also thought that it worked thematically. One Gamer Geek said, “If diseases and viruses have taught us nothing, they will always find a way to get you.” Yes, and so too, the zombies. ZOMBIEPOX is not an abstract puzzle game you solve. It is, however, a game you can win. At its core, this is a game about risk management, control, and containment. The control aspect of the game is an illusion, however, due to the random card draws. The best a player can hope for is containing the spread of the ZOMBIEPOX by reducing the number of people who can get infected. At first, the infection will be fairly easy to contain, but as the outbreaks start showing up, sections of the game mat will become hot zones and split the players’ attention. The only way to survive is to create barriers of vaccinated townspeople to act as a firebreak. To be clear, the game is very winnable, but the zombie tolerance level will ultimate decide how easy the game can be won. I highly recommend you introduce the game at a zombie tolerance level of no less than 5 when you first play. Setting it at 6 is too easy and setting it at 4 might be a bit more difficult than new players care for. You want to give players a chance to win and a chance to lose. A sure victory isn’t much fun and a sure defeat is even less so. I rather like ZOMBIEPOX. It’s an atypical Zombie game that I found refreshing. Instead of acting like a gun-totting survivor lost in a zombie wasteland, I felt like a medical doctor in a HAZMAT suite in the 1950’s doing my damnedest to save a town that was going to Hell. That was really cool and frustrating. There were a number of times where my team members and I were just out of options or could not specifically address a trouble spot. Random outbreaks were also a nuisance, but all it ever took was a calm head, good team work, and a bit of luck to get the risk back to tolerable levels. Do try ZOMBIEPOX when you have a chance. I think you’ll find it to be an interesting cooperative abstract strategy/puzzle game that will challenge you to control that which can only be contained. If you have little geeks running around and terrorizing your home, you know exactly what I mean. 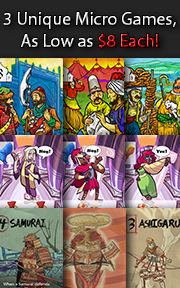 Tagged Abstract Strategy Games, Child Geek Approved, Cooperative Games, Educational Games, Father Geek Approved, Gamer Geek Approved, Medical Games, Parent Geek Approved, Puzzle Games, Solitaire Games, Zombie Games. Bookmark the permalink.